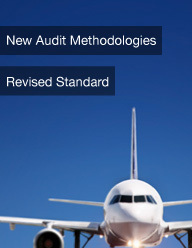 With the introduction of the revised aerospace standards and the completely different audit methodology defined in the latest AS9101 many organizations struggled to meet the new requirements. The aerospace industry and the registrars are warning that maintaining the certification will be harder than getting it in the first place. Organizations are finding subsequent surveillances being increasingly tougher. In order to enable military, defense, and aerospace organizations to succeed Eagle Force has developed a series of informative training messages that provide tips and guidances. Many organizations are using them as internal training material. With Aerospace Experienced Auditors on staff and over a 150 successful certifications, Eagle Force has proven expertise to effectively and economically help both large and small organizations. Eagle Force’s consulting clients have been certified to the following aerospace standards: AS9100, AS9110 and AS9120. Industry Controlled Other Party (ICOP) certifications are considerably different than the standard ISO 9001 certifications. Aerospace OEM’s, in an effort to improve their supplier performance, have taken oversight authority in the certification process. Both the registrars and the accreditation bodies must report to the aerospace OEM’s through the AAQG’s oversight board, the RMC. In effect this has ramped up the intensity of the audit process and increased the emphasis on the requirement for organizations to manage their systems using the process approach. When the Aerospace industry decided to use the Industry Controlled Other Party (ICOP) system to control the certification of aerospace suppliers, it have several key components, one of which was to only recognize certified Aerospace Experienced Auditors (AEA’s). When an organization is audited for certification to an aerospace standard, the registrar must use an AEA, of which there are very few. There are thousands of ISO 9001 auditors but only a couple hundred certified Aerospace Experienced Auditors. Having an Eagle Force AEA on your consulting team is going to help ensure that your aerospace management system is respected and accepted by both registrars and OEM’s. The Aerospace industry developed an Online Aerospace Supplier Information System (OASIS) to provide an official world-wide directory of IAQG members, accreditation bodies, approved registrars, certified aerospace experienced auditors, and certified organizations. This directory provides the added service of bringing together aerospace certified companies with potential buyers who use the database to find suppliers. AS9100 is the aerospace standard for aerospace manufacturers; AS9110 is the aerospace standard for aerospace maintenance operations, and AS9120 is the aerospace standard for stocklist distributors. Eagle Force is one of the few consulting firms in America that has expertise and success in all three standards.